I woke up this morning with an aching heart. The reality of our challenge piercing through the veil of our modern lives. 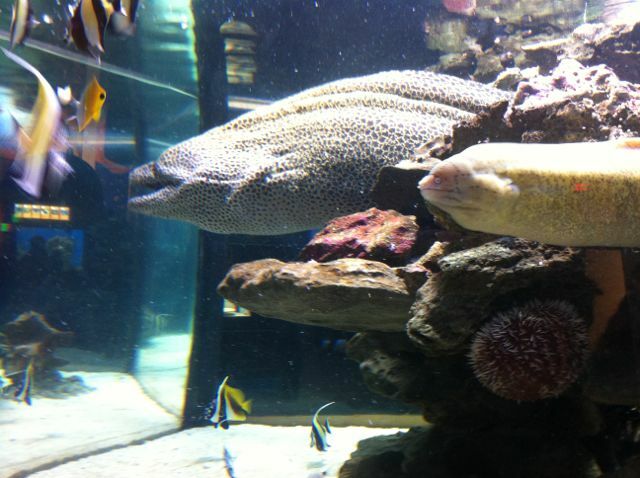 We spent yesterday at the Two Oceans Aquarium in Cape Town. An incredible place, where we were brought into the under water world. It was a wonderful experience. We spent all afternoon as a family moving through the Aquariaum. Marvelling at the beauty of the Knysna seahorses, being transfixed by the sheer size of the giant spider crab, and falling in love with the solo green sea turtle. By the end I was inspired by my meeting with Life and distressed by my meeting with Man. Much of the messaging at the Aquarium was around how man is impacting marine life, with ensuing advice to counter the challenge: Don’t buy plastic bags, stop eating prawns, only eat fish on the SASSI green list (this is a list compiled by the Southern African Sustainable Seafood Initiative, which groups fish according to a green, orange and red list. Those on the green are still fine to consume, those on the orange pose cause for concern either because of overfishing or because the fishing/farming method poses ham to the environment, and red are fish that unsustainable and/or illegal to fish in South Africa). Whilst this messaging was a big part of the displays they were at the same time prominently presenting their sponsors: I&J the largest fish processing company in South Africa, and the Ocean Basket, the nation-wide fish restaurant chain. Even these companies in their messaging at the aquarium were encouraging us to only eat fish off the green list, and yet I am certain they themselves sell fish that are on the orange list, such as prawns, kingklip, or line-caught mackerel. It reminds me of conversations at the recent WEF summer meeting in China around sustainability. They mostly focused on how to get the consumers to want to buy sustainable products. The sub-text seemed to be, “for as long as they are willing to buy products that destroy the earth, we will have to continue to provide them.” “We have to stay competitive”. And so passionate men and women were working together to educate the consumers. Whilst this is obviously important, I did not encounter conversations on how we might tackle the challenge further upstream; how we might begin to shift a system, which requires constant growth for a business to survive. Grow, grow, grow. Or die. And so as a result we turn mother-nature into a commodity – into many! – and relationships into services, moving further away from community and into trans-actionality. And this we assume to be the natural way. In fact it seems to me that anything that questions this is radical, counter culture, activism – words that all have negative connotations. So the wonderful woman at the aquarium was teaching us about the penguins and the tragedy of the plastic bags, and the bottle caps that kill so many birds and seals. I am sure she longs for a world in which these animals that she cares so deeply about can live without being threatened by man – and yet she is also living in a world where her daily existence, shopping, eating, driving to work, are all directly contributing to this plight, which she wishes to alleviate. We each are. I recently read an article about a woman who has spent the last five years not buying any plastic. As she has not started making things herself, it has meant living without bottled water, meat (most is wrapped in some kind of packaging), yoghurt, etc.. She was described as a zealot. I take it that living sustainably in today’s systems may require zealous behaviour. My mind returns to my work in Zimbabwe. In which we are entering more consciously questions of sustainable living, natural and organic food and products for the home, where we are learning how to grow and make our own medicine – and, this is the new part, begin to turn that into our own local economy, to begin to be able to exchange these products filled with goodness, and even love, with each other. And in so doing to strengthen our communities, to re-create even, bonds that have been weakened or severed by the advent of a consumer focused monetised world. And let me be clear: Money is not in and of itself the problem. Having it enter every single human and natural domain is. Having it be designed to create scarcity through its creation as debt, so that more always begets more, is a deep-seated problem of our monetary system. So I wonder – as I feel a pull now to not only live our own small but important experiment. I wonder what might be our contribution to the larger shift of which I hope we are a part? How might we, with the many many others who are stepping out of a system, a machine, that we can see no longer serves us; how can we be a part of changing its DNA? Business is not inherently evil. But business is no longer, ultimately, in the business of producing quality products and services to people – things they believe in and are proud of contributing to the world. Business, through this inherently growth-propelled system, which we have co-created, is in the business of growing money – and that is a very different bottom line. Perhaps simply being in the question is enough for now. Being in the question of what will it take for us, who long for a shift, and what can be my role to support that shift, from the wonderful gritty practicality of the local, to the larger shift of the global. Ah – that we may be a part of it – a return to a world that our hearts long for; and that our hearts know to be possible… but that our minds cannot yet grasp.